There was so much hype built-up around the impending appearance of US-based electricals group Best Buy in the UK that it would have been very tough for it to live up to the pre-match billing. Expansion into the UK wasn’t supposed to be like this. But oh, how much shorter could it have fallen of those early expectations. Not much I reckon. The initial opening was delayed for some months as it battled to find suitable sites. The result being that the grand objective of opening 80 stores soon moved from being a possibility to merely a dream. Little wonder then that much of the senior management team have jumped ship/been-pushed-overboard in recent weeks. Looking back, it never looked that good from the start – with the man leading Best Buy’s move into the UK, Bob Willett, ‘retiring’ just before the supposed opening of the first stores. 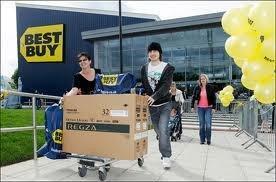 Best Buy stores: rare beasts in the UK retail jungle. Clearly, the big cheeses in the US sussed out things weren’t going to plan way back in November 2009. Although Willett had a patchy record in the UK (offset by his great self-promotional abilities it has to be said) before linking up with Best Buy he can’t be blamed for the Best Buy debacle. It’s mainly down to the retailer following that well-trodden path of US operators bigging up their moves into the UK and then completely under-estimating the competitive nature of the market. Costco was supposed to shake-up the retail world – but where is it now? Wal-Mart has done a decent job with Asda but it doesn’t run the country as predicted, and Whole Foods Market was supposedly going to revolutionise merchandising and super-charge organic sales in the UK. It hasn’t quite managed that. There must be loads of other examples of such failures. But the fact that I can’t think any of them probably shows they have either retreated entirely or faded into obscurity.